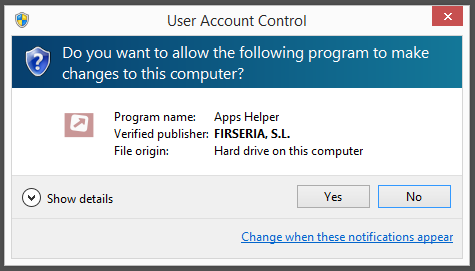 Just a note on a publisher called FIRSERIA S.L. The FIRSERIA S.L. 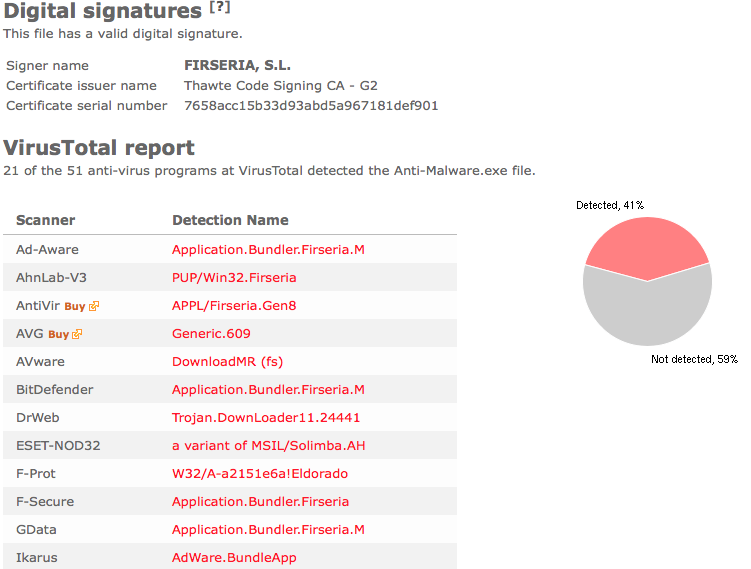 download that I found had a high detection rate, 41% when I uploaded it to VirusTotal. Did you also find a download by FIRSERIA S.L.? Was it also detected when you uploaded it to VirusTotal? Information Technology Systems seems to be located in Montenegro based on the embedded certificate. The current detection rate is 16% according to VirusTotal. InstallCore appears to be the most common detection name. Did you also find a Information Technology Systems file? Do you remember where you downloaded it? Hello there, hope you are having a great weekend. Just found another adware variant called RockResult. It appears that RockResult has been around for a while, at least a month, judging from the other anti-malware bloggers. But since I found it bundled today, I though I should write a short post about it. I’m sure you’d like to remove RockResult, and that’s pretty easy with FreeFixer. 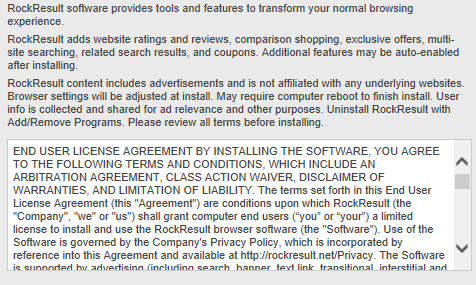 Select the RockResult files, as shown in the screenshots below, click Fix, and reboot your machine and the ads should be gone. I found the SyncPulse Manager software while installing another download called BitLord. SyncPulse Manager was included in the BitLord installation package, or installed by one of the programs that were bundled with BitLord. Unfortunately, I could not see any notice that SyncPulse Manager would be installed while proceeding though BitLord’s installation wizard. Maybe I did not examine the various licence agreements shown during installation with enough care, or perhaps SyncPulse was not disclosed at all? 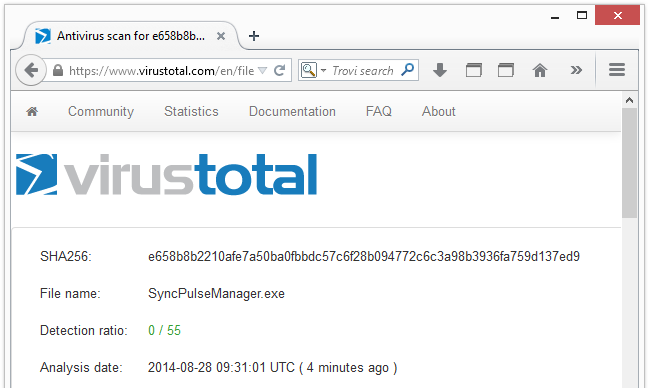 Out of curiosity, I uploaded the SyncPulseManager.exe file to VirusTotal. Currenly, none of the anti-virus programs is detecting SyncPulse. It will be interesting to see if any of them will detect SyncPulseManager.exe. How did you get SyncPulse Manager on your computer? Please share in the comments below. If it was bundled, did you see any disclosure that it would be installed? RocketTab inserts its ads while you browse the web. Here’s the ads are labeled “Ads by RocketTab” and appear on the Google search results. As always when I find some new bundled software, such as RocketTab, I upload the files to VirusTotal to see what the other anti-virus programs report. And the detection rate is very low: 4%. 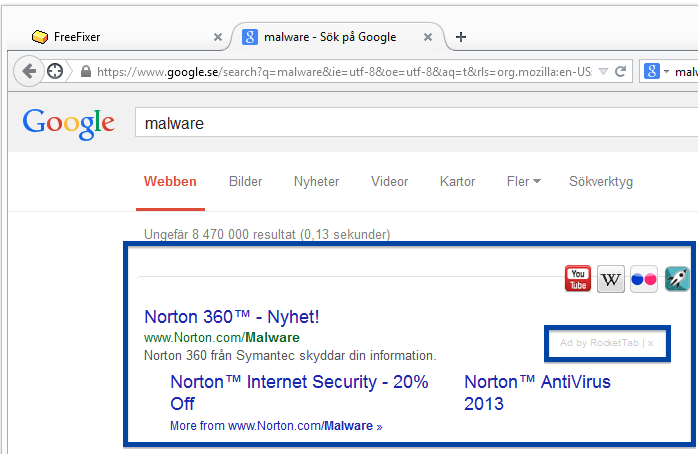 The detection name is Adware.iBryte. Removing RocketTab is pretty easy with the FreeFixer removal tool. Just select the Client.exe process and scheduled task for removal, reboot and the problems is gone. Hope that helped you figure out what RocketTab is and how to remove it. How did you get RocketTab on your computer? Please share in the comments below. 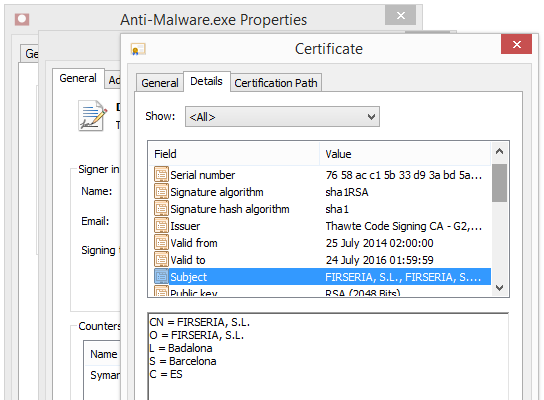 Update 2014-09-18: Client.exe is now digitally signed by Inertware. Hello readers! Today I’m posting removal instructions for yet another adware variant called snipsmart. The snipsmart adware is bundled with other software downloads. So if snipsmart appeared unexpectedly on your machine, that’s probably how it was installed. 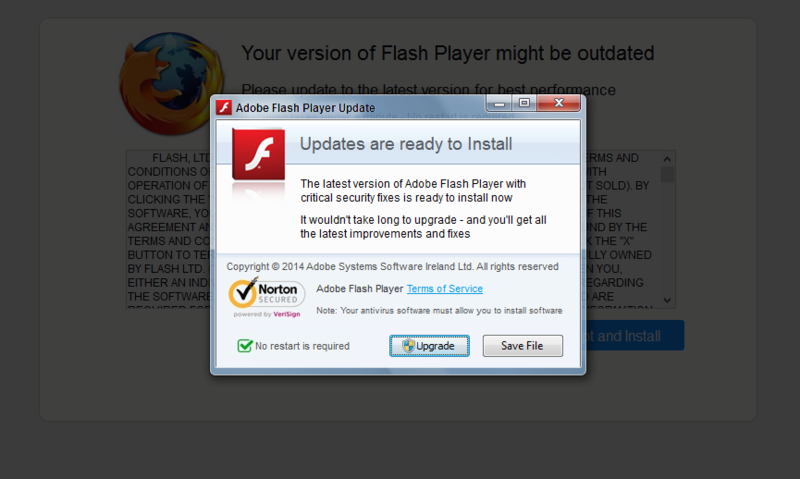 Typically, this type of adware adds banners on web site while you are browsing the web. The ads are usually tagged with texts such as “Snipsmart ads” or “Ads by Snipsmart“. However, for unknown reasons, I did not see any ads. Do you see the snipsmart ads on your machine? Please take a screenshot of the ad and send it to me and I’ll post it here on the blog. Thank you very much! Hope that helped you figure out what snipsmart is and how to remove it. 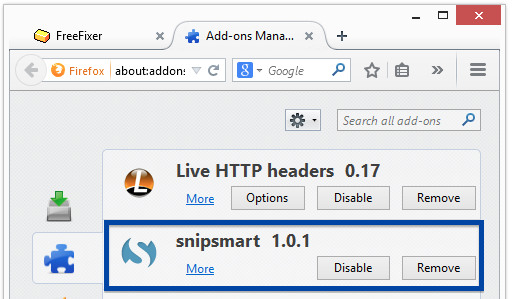 How did you get snipsmart on your machine? Please share by posting a comment. Neurowise content includes advertisements and is not affiliated with any underlying websites. 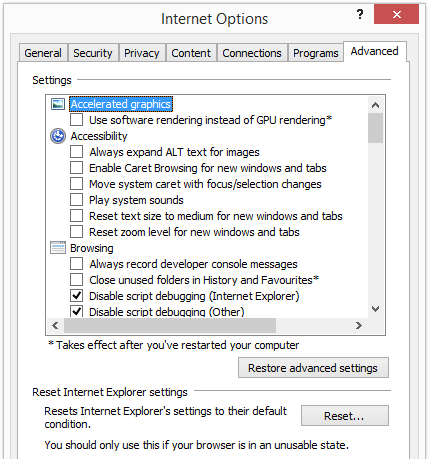 Browser settings will be adjusted at install. Typically, this type of adware shows banner ads labeled “Ads by Neurowise” or “Neurowise Ads“, but for some reason I did not see any ads while browsing around with neurowise installed. Did you spot any Neurowise ads? How did they look like and where did they appear? 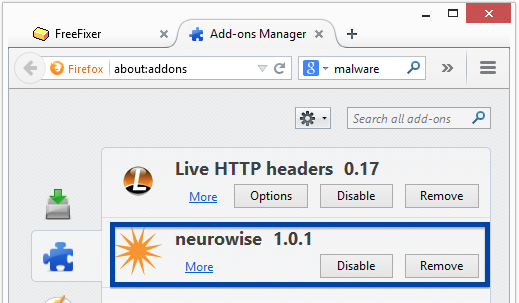 The majority of the anti-virus programs over at VirusTotal are detecting Neurowise, as shown in the screeshot below. BrowseFox and AltBrowse are some of the detection names. Hope that helped you figure out what Neurowise is and how to remove it. 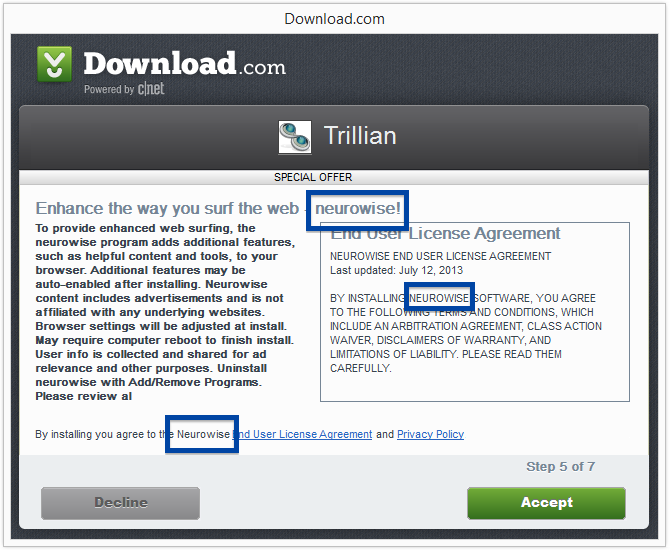 Did you also get Neurowise from Download.com? The anti-virus scanners seems to be pretty up to date when it comes to detecting InfiniNet. The detection rate is 45% which I think is pretty good. Some of the detection names are BrowseFox and AltBrowse. 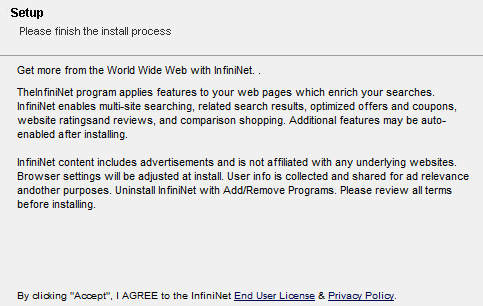 How did you get InfiniNet on your machine? Please share by posting a comment. Hello there, just a quick post on a publisher called Kiril Skiba that I found while running some tests on FreeFixer v1.12. I should have this new version of FreeFixer out this week. The suspicious file is named ldownload.exe and the following screenshot shows the User Account Control dialog when running the Kiril Skiba file. The digital certificate appears to be relatively new. It’s valid from the 11th of Junly, 2014. According to the certificate, Kiril Skiba is located in Ukraine. 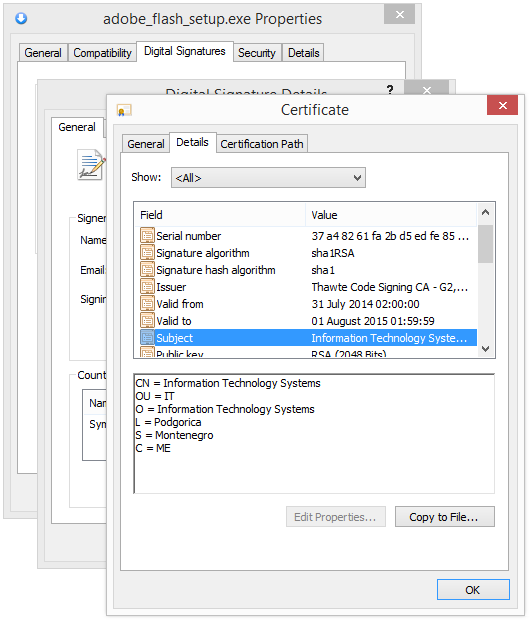 The certificate is issued by Certum Code Signing CA. At the time being, the detection score for the Kiril Skiba file is very low. When I uploaded the file to VirusTotal – as I usually do when I find something that looks suspicious –  only QIhoo-360 and VBA32 detected the file. The detection names are HEUR/Malware.QVM10.Gen and suspected of Trojan.Downloader.gen.h. With those two detections, I’d stay away from the file. It will be interesting to see if the other anti-virus programs will add this file it in the future. When I tested to run the Kiril Skiba file, nothing appeared to happen. I could not see any modification at all on my lab computer. No windows popped up. Nothing. 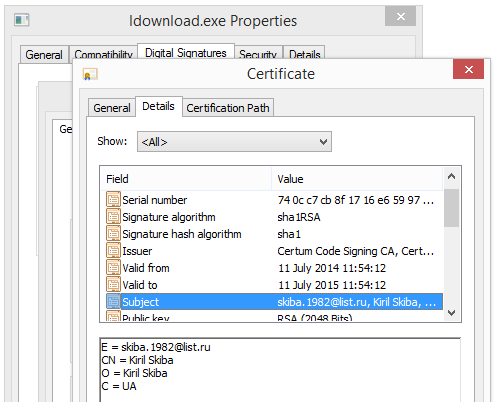 Did you also find a file digitally signed by Kiril Skiba? Did it pose as something useful? Did your search settings and home page in Chrome, Firefox and Internet Explorer just change to websearch.fixsearch.info? No worries, I’ll show how to remove websearch.fixsearch.info from your computer. I found the unwanted websearch.fixsearch.info search engine while testing out some downloads. The downloaded files were digitally signed by Igor Kramoren and Alexey Kurilenko, publishers that have previously bundled unwanted software with their downloads. How did you get fixsearch.info on your computer? Please share by posting a comment. So, the websearch.fixsearch.info removal. One way to do the removal is to use the FreeFixer tool. Click the Start scan button. It should complete in about 5 minutes. Check the websearch.fixsearch.info items in the scan result. 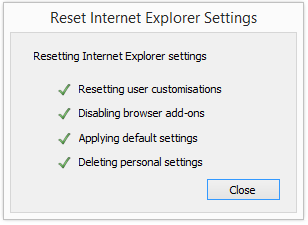 You can also use the reset function in Firefox, Chrome and Internet Explorer. The reset feature restores many settings of the web browser to its default state. The problem is that it may do a little to much. Click the menu button in the upper-right corner of the browser. Then click the Help button at the bottom of the Firefox menu. If you cannot access the Help menu, type about:support in the address bar to open up the Troubleshooting Information page. 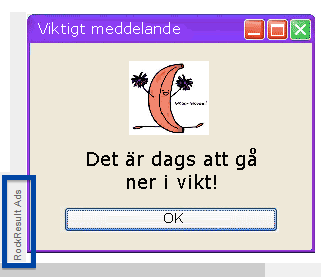 A dialog will pop up explaining what settings Firefox tries to preserve. Notice that everything else will be removed! 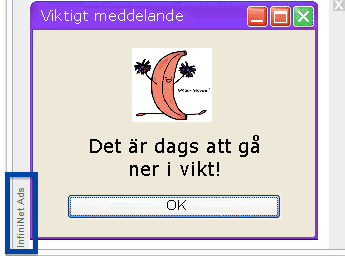 To continue, click the Reset Firefox button in the confirmation window that opens. .
Firefox will close and reset itself. When the reset is done, a window will list the information that was imported. Click Finish and you’re done. 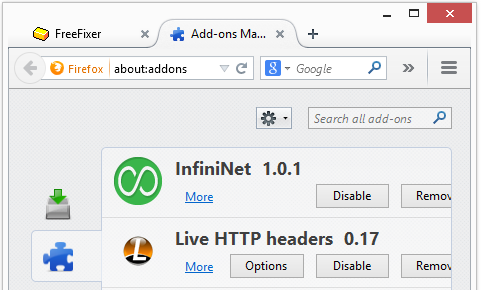 On the Tools menu, that appears in the upper-right corner of the browser, click Internet options. If you can’t see the Tools menu, press Alt on your keyboard. 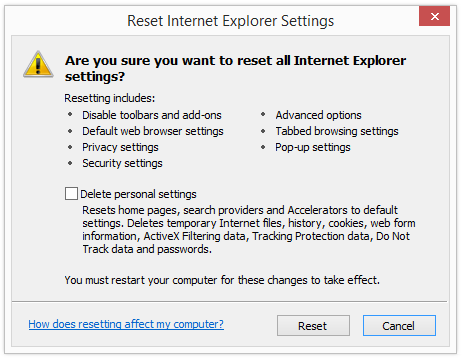 Click Reset… If you’re using Internet Explorer 6, click Restore Default. Select the Delete personal settings check box if you want to reset home pages, search providers and accelerators. Delete temporary Internet files, history, cookies, web form information, ActiveX Filtering data, Tracking Protection data, Do Not Track data and passwords. When Internet Explorer has finished applying the default settings, click the Close button. Hope that helped you remove websearch.fixsearch.info.